A while back, I wanted a nightstand with some drawers to store clothes and my "accessories" (i.e. wallet, keys, cell phone). Somewhat careful research led me to the Ikea MALM 2-drawer chest because its stated dimensions appeared adequate and it did not offend me. Not having any money issues at the time, a trip was made to Ikea to inspect the MALM on the showroom floor. The inspection was made, I was pleased, and I proceeded to the warehouse area without writing the item's location down -- I tried to remember the aisle written on the info tab attached to the floor model. Upon arriving at what I thought was the right aisle, there was a surprise. The piece of furniture that I found was a 2-drawer chest. It looked like the MALM, and color was labeled as birch-ish. However, the price was lower than what I thought I saw earlier in the showroom and what I researched online. Jackpot? Nothing appeared to be amiss until I had already gotten home and was midway through putting the 2-drawer chest together: it looked smaller than what I thought it would be. This was important because I had bothered to use a measuring tape to make sure it would fit somewhere. Also, where was my veneer? I think I remember feeling ripped off. A lot of time later, I don't remember exactly when, I went on to the Ikea website and found my error. Or did someone tell me? Anyway, it was a KULLEN. I bought a KULLEN 2-drawer chest, not a MALM 2-drawer chest. 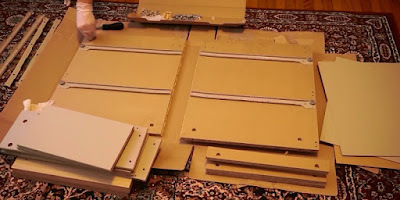 The worst part, actually, is that I thought that I just bought the wrong MALM chest. I was under the impression, until I found out about the KULLEN, that there was a smaller and a larger MALM 2-drawer chest. Apparently, Ikea stocked two pretty similar 2-drawer chests. There was the more expensive MALM and then there was the cheaper KULLEN. When I checked the American Ikea website in September 2015, both drawers were still available. I bought my KULLEN years prior when there was still a birch-ish version available -- there was only a black-brown one when I wrote this. So, what is the difference? Why is one more expensive than the other? Why not just go for the cheaper version without thinking about it? I'm going to try to figure that out myself here by looking at some of the product details on the Ikea United States website. Disclaimer: I had not had any firsthand experience with the MALM product or the current KULLEN product (mine was over a year old) when I wrote this piece. Details were quoted from the Ikea United States website or Canada website in September 2015. Details on this page are NOT guaranteed for accuracy. Common materials under "Product description" among both drawers were particleboard and fiberboard. The main difference I noticed was that the black-brown MALM mentioned "ash veneer" while the KULLEN did not -- "foil" was mentioned a few times for the KULLEN and also found under the birch veneer version of the MALM. For some reason, the black-brown MALM listed "Mirror glass: Glass" under the "Product description." Maybe there was an error or a mirror hidden somewhere in the chest that I didn't know about? Doubtful on the latter. Otherwise, from the dimensions, the MALM was clearly larger by 5 to 8 cm in the three dimensions. The noted package weight was also about 12 lb (~50%) heavier than the KULLEN. Not sure how much of it would be extra packaging. Looking at the photos on the product pages, I noticed two exposed screws on one side of the KULLEN. No exposed screws appeared visible to me on the MALM. There was also a line of some exposed wood sticking out on the inside face of a side panel on the KULLEN. This was also not found on the MALM. And if you're curious, when I checked, the white version of the MALM was US$ 45.99 for a savings of US$ 4.00 -- the white version was the same price as the others, CA$ 69.99, on the Canadian website. Different Angle -- and different Camera White-Balance. Woops. What does an extra US$ 20.00 appear to get me? I am seriously considering picking up the MALM 2-Drawer chest just to see my KULLEN and the MALM side by side. Until then though, all I have are the product details. What they suggested to me was that an extra US$ 20 or CA$ 30 would get me a nicer exterior surface, better finishing, a slighter bigger chest, and some more solid mass. I have to admit that those things were, way back when, and still would be worth it to me. This would be especially true if I planned on coordinating my furniture with more sets from the same series -- when searching "KULLEN" and "MALM" on the American Ikea website, I found three results for the former and over a dozen for the latter. Update with videos: Bought a MALM and got to see how it looked side by side with a KULLEN. And that's why you need to check the product numbers, not just the aisle numbers! Incidentally, the mention of mirror glass for Malm probably wasn't an error - the tall narrow chest does have a mirror hidden in the top.